A recent BI Intelligence report, Here Comes The Internet Of Things, finds that the number of everyday and enterprise devices connected to the Internet will grow to 9 billion by 2018. The Internet of Things (IoT) reality affects individuals and businesses alike; and a top concern with usage is information security. Some of the entities that are using IoT include waste management systems, smart electricity grids, water systems and meters, as well as warehouses, and connected factories; not to mention the level of information data centers need to prepare to store and secure. The damage and danger that would come from unauthorized intruders gaining access to any of these facilities is scary. It isn’t news that the Internet itself is insecure and full of vulnerabilities. As the number of devices connected through the network increase, CIOs will have a lot more devices to manage and keep an eye on, in addition to securing their network. Equipment and devices remotely connected through the network lack strong security measures. User IDs and passwords do very little for security. A bigger amount of sensitive data to secure. Lax security measures are not an option. Continuous monitoring; testing and scanning your network for vulnerabilities on an ongoing basis. Setting up a strong physical security to ensure no one can gain access to your servers, data centers, network systems, and device control areas. Developing policies and procedures now! BYOD and cloud usage are growing within the enterprise environment; insider threat is not going away. Standard security measures, training and sharing knowledge on data security with your staff is a must. Objectively knowing if you lack the necessary manpower to keep a high level security for your enterprise. Business disruption preparedness and planning to avoid losing sensitive data and clients. Developing a holistic security posture. A strong defense is a proactive one, which can only be built with a full view of your network and connected devices. CIOs are already under a lot of pressure when it comes to information security; the IoT boom will only increase this responsibility. This means more resources and enough manpower to implement the necessary level of risk management actions are required. 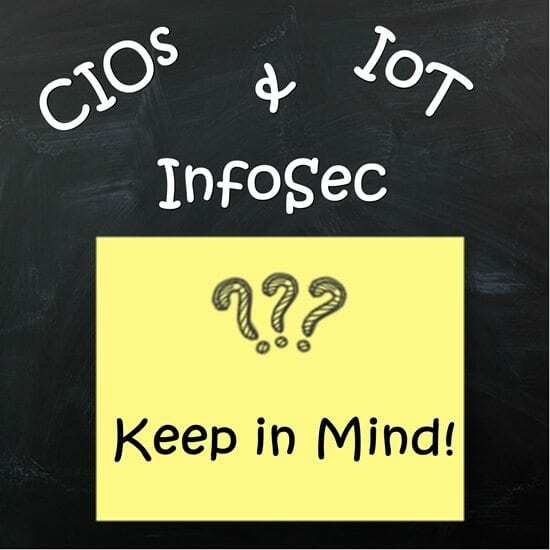 How are you preparing for the information security challenges that come with the IoT?